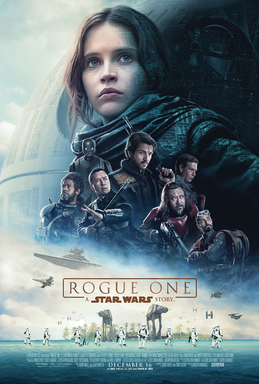 The plot follows Jyn Erso (Jones), the daughter of the designer of the Death Star, and her quest to retrieve the plans for destroying it. The good; we’re back in the Star Wars universe, this time we’re in it moments before the original 1977 film. If you haven’t figured it out from the trailers yet, Rogue One is about how the Rebel Alliance retrieved the plans for the Death Star and were able to exploit a weakness and destroy it. It feels like coming home with this film taking place in the same timeline as the original movie. Seeing the original X-Wings in battle again is wonderful. Speaking of the X-Wings, the Star Destroyers look amazing, and even better than the X-Wings. Whatever ILM did, they made those Star Destroyers look like practical models again. You’ll have to see it to understand it. The story is back to basics. There’s a singular goal and everything that’s done in the film is to achieve that goal, or hinder it. The audience was very quiet, they cheered at the right moments, and laughed at the right time. When a movie captures the audience this way it’s a very very good sign. The third act is one of the best I’ve seen in a while. My favorite part is how the Rebel fleets fights the Empire using their own weapon against them… that’s all I’ll say. Oh and cameos/easter eggs galore! The bad; I’ve only seen this film twice as of this posting. Overall, Rogue One is wonderfully done. There are no force-weilding individuals which brings things back to a military strategy action adventure film rather than the fantasy genre. From the first Star Wars film we get the sense of a lived-in world, Rogue One manages to continue that and even evoke those feelings and emotions from the awe of the first trilogy. Without giving anything away, Alan Tudyk as K-2SO steals the show. And Donnie Yen is awesome. This film and the show Rebels manage to bring us back to the magic.